In this month’s episode, the boizz say a special farewell to Rob F.’s physical presence, as he begins his transformation into Virtua Rob, along with the help of a special VGM karaoke submission. Take a journey through pubescence in another classic free play episode, grow with the boizz, and let it drizzle through you. Full track listing below. That KeyGlyph/Sentimental joint seriously got to me. It's nice to know this show means as much to so many others as it does to me. I feel like I'm hanging out with America's Game Boizz and all the other users every time I listen. And I listen on my commute in the DFW area, which is about an hour and a half to two hours twice a day, so I literally (literally) spend half my day listening to LMH. It's like hanging with my friends half the time! I'm honored to have been mentioned at the top of the show in this, the final episode of this phase of the show. I'm excited for LMH: Phase 2! 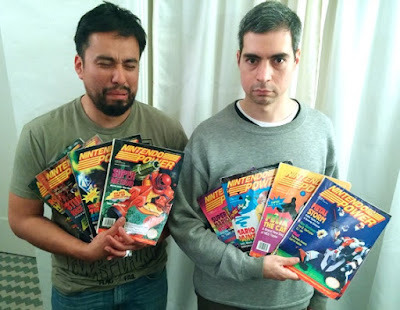 Thanks to Brent and Rob F. for 165 awesome face-to-face episodes (counting the solo Brent stuff). On behalf of all the users: Good luck in Port Town, Rob, and to you both: we salute you! I'm so happy you guys are continuing the show even though Mr. Switch is moving. I have been listening since around episode 50 and have come to look forward to every show. Good Lord, that was an episode to remember! KeyGlyph and Sentimental in SanGabriel, I salute you(SiSG, salute x2). Both amazing VGM Karaoke performances, and awesome getting Chun Li, E. Honda and Zangief to chime in(BTW, that record skip was from Earthworm Jim, right?). And that LMH Karaoke song had me grinning ear to ear the whole way to work. For once in my life, I was jealous that I didn't live in LA. I would have loved to be part of that surprise party. On the other hand, living "above the coast" as I do, I'll be here to welcome Rob when he gets up to Portland. Rob and Brent kept talking about the drizzle......it must have been providence, because drizzle is what it does up here 9 months out of the year. It's like Portland wants to rain, but doesn't want to extend the full effort to do so. :) Incidentally Rob, drop me a line when you get into town and I'll fill you in on the best places to get retro games. BTW, Port Town is a great nickname("Stumptown" is the dominant nickname here, and also the name of the best coffee company in the world), but I always liked River City. But let me not forget about the music! Brob, I salute you both! Dare I say the track selection surpassed the level of Bonk and came dangerously close to Air Zonk levels. Hikoshi Hashimoto was out in full force. Both the Cosmic Carnage and the Shura no Mon tracks were amazing. I also loved the Gross Toes 2 track, but might I say that I was totally surprised by the Lucky Luke track. I generally really like Alberto Jose Gonzales's work, but I'm generally not a fan of Gameboy music. Its bass sound is kind of harsh sometimes. Having said that, the Jail track was awesome. Loved it. That Turok track is one of the most embarrassing ones I've composed because now I find it weirdly similar to Charlie's Angels theme. Have you ever listened to Turok 3 and Turok Rage Wars? The last one was composed with huge inspiration from Yuzo Koshiro's works, which I really love. I think its one of my most technically advanced soundtracks. Rob I wish you the best on your new place. Please don't stop being awesome you both. Hugs & beers! Mr. Gonzalez, I thought the Turok track was awesome, it may have sounded a little similar to the Charlie's Angels theme, but I didn't hear it until you mentioned it. Still very good. Hey everybody! Sorry to be all up in this episode! I just love this show, I love VGM Karaoke, and that's how it happened. I hope I didn't distract from the otherwise excellent jams, my favorite of which are the Turok track (despite Mr. Gonzalez's feelings about it), the Code Name Viper Track and Cosmic Carnage. I had an awesome time at Rob's going away party, where I got to play Double Dragon with the Gabe and the Switch, and collaborating with the ONE AND ONLY KEYGLYPH on "Greener Hill Zones." It should be noted, that she came up with the idea and structure, composed basically all of the lyrics, and did the final mixdown of the track. I found the Street Fighter II sounds and the Earthworm Jim sample, and just tried to fit in. I will get down and cry. Even if you leave my car, I'll never say, "goodbye." (creepy reference about my car is just about me getting out of my car where I was listening to LMH, and putting in my headphones to keep it playing). And that's it! I second Andy's statement above. I love the LMH community, and I also like the idea of the 16 bit donation. Are there 8 bit and 32 bit levels? Classic! The Karaoke songs only enhanced the episode. Sentimental is being way too humble about his contributions to the karaoke. First of all, I specifically sought him out for the project because he's the premier VGM Karaokeist and I needed his skills; I hadn't been planning on singing at all because the notes were too darn high, and I needed a vocalist who could hit them. Not only did Sentimental pull them off like I knew he could, but he's the one who suggested the idea of a duet, which inspired me to give it a try. He also came up with all the sound effects, and I think the record scratch is the funniest part of the entire thing (followed closely by his party outro). So yeah. That's the truth about the Sentimental situation! Rob: I noticed that you were totally repping the Game Boy even before you mentioned my text. I was walking my dog with a huge smile on my face. And the Batman and Robin track had a great groove, nice pick. IN THE FAM-LEE JEWELS!!!" running through my head, transitioning into both sections of SinSG and Keyglyph's song. It's ten past noon and they're still running through my head. So good! Aw, thanks for all the nice comments about the collaborative karaoke, everybody. It was a ton of fun to do. I highly encourage other joint ventures among the users! Here's hoping Rob's move goes smoothly and that the Double Dragon brothers stay strong as they part ways. And many thanks to The Gabe for helping the podcast continue remotely! And also, I loved this episode. I laughed really hard at the closing Rob Hubbard conversation -- it was the perfect way to cut through the semi-gloom of the moment and crack everybody up. And so many jams! I did a lot of stationary dance moves to several of these tracks, as several witnesses can attest. Great episode, as always! Thanks for keeping the show alive even after the move. Rob, I hope you like Portland, I'm originally from there and you'd make a great addition to the city and its creative scene. A great episode, and so community focused. The LMH fans are hands down the best gaming related community on the internet. Other online gaming groups are so jaded, bitter, and salty. It's so refreshing to see an online gathering that's so positive towards each other. Rob: Safe travels, and hope you find great success at your new location! As for the show: Am I the only one who's super pumped for the computer music episode?!? It's pretty much my jam these days. Especially the Commodore 64. Love the MSX too. You're not the only one, Nick -- I'm psyched for the computer episode! I'm hoping we'll see a good showing of LucasArts point-and-clicks. The Secret of Monkey Island is the obvious one, I think, but I keep wanting to recommend Day of the Tentacle in particular. Problem is, I can't find the Sound Blaster sound card versions on YouTube, just general MIDI stuff, which doesn't sound nearly as good. I also loved the music from the Journeyman Project: Turbo. Very new-agey. Anybody remember that game? Scared the heck out of me and I loved it. I am also looking forward to a PC episode; LucasArts games were very good. I heard an interview recently with the guy who did Monkey Island and Grim Fandango, talking about the Grim Fandango remake. It sounds like it will be fantastic. The thing about PC music I never liked is there isn't one particular way it's delivered(same with the graphics). Non-Redbook audio PC music of the Legacy era was ALL MIDI. MIDI is basically the sequencing, instrument, and effects/levels information of a composition. That information is then interpreted by the computer(or keyboard or sequencer, since MIDI was originally developed for the music industry) as sound. The specifics of how that music sounded was entirely on the end user's sound card(or lack thereof). If they had a crappy pack-in sound card, then the instruments and effects we'd hear would sound like what you call MIDI. SoundBlaster cards had better instruments and effects envelopes, so they interpreted the music in a more pleasing manner. That's what I always hated about PCs, and that's why it's kind of hard to do a PC music episode. It's like sampling the quality of cinematography on an iphone. Who knows what that looked like originally? That said, I'm still looking forward to the episode. I trust the Brob's judgments, and I know they'll come up with some fancy, Bonk tracks for us to put in our earholes. Keyglyph, I actually have a copy of the Journeyman Project Trilogy on CD-ROM. Funny thing is, I've never played it! I bet I would have a hard time getting it to run on Windows 7. Nathan, I understand your feelings about PC music, since it was an open platform. But remember, the Commodore 64, Amiga, Atari ST, ZX Spectrum, MSX, and Sharp X6800 are all computers as well, and they have closed hardware, for the most part. There is so much out there! The cool thing about this video is that it includes both the Adlib, and MT-32 versions. This has, in my opinion one of the best usages of the Adlib card in a game. Just check out that pipe organ @ 2:06. There are so many instruments overall in this one piece, I just love it. Everyone seems to remember Lucas Arts, but Sierra's stuff always stuck with me forever. It's a shame that the company has been all but forgotten today. Hey Nick, you can get the whole series on GOG, if you're so inclined! It also looks like the first installment was recently greenlit on Steam, so that's another potential option. Looks like the only caveat is that both services are only offering the remake of the first game (Pegasus Prime), not the original-original. I don't know if that'll matter to many people, but it's a detail worth being aware of. I couldn't get very far in Journeyman, but it was far enough to be captivated by it. I've always meant to go back and see if my grown-up brains would be better at it. I like to hope so. I'm sure you're researching thoroughly already, but check out Tim Follin's Ghouls 'n Ghosts soundtrack for C64. For a couple tracks, he takes a tiny bit of Tamayo Kawamoto's work and just goes somewhere else entirely with it. The highlight for me is the Crystal Forest BGM. He does the same thing for a few more tracks in Bionic Commando. Another recommendation: Loopz by David Whittaker. Although there are Game Boy and NES versions, I don't like how the NES version sounds, and the GB music doesn't seem to emulate well. Also, all the games I mentioned have Amiga versions with the music adapted. Generally I prefer the C64's synthesis over the SNES-like Amiga sound, but there is some worthwhile extra dimension to the Amiga tracks. They feature TONS of C64, and Amiga music, all recorded from real hardware. World's better than emulated soundtracks on Youtube. One more thing: those glissandos in the Hyper Marbles track reminded me of the player piano in "Build Voice" by Dan Deacon.